SBMI would like to congratulate the following fall 2018 scholarship recipients. ISBMI Professor and Center for Precision Health Director Zhongming Zhao, PhD was recently awarded a Cancer Prevention & Research Institute of Texas (CPRIT) grant. The core facility award is worth more than $4.4 million. With the grant, Zhao will launch the UTHealth Cancer Genomics Core (CGC). His goal is to use the CGC as a means to advance cancer genomics and precision medicine– the practice of applying genome sequencing to biological samples to identify genetic changes that could be linked to cancer development, tumorigenesis, or drug treatment of cancer patients. “The objective is to build a genomics resource to support researchers at UTHealth, throughout the Texas Medical Center, and across the state, so they can better utilize modern genome sequencing technologies for cancer discoveries, prevention, and patient treatment” stated Zhao. Members of the SBMI Community have recently achieved noteworthy accomplishments. We want to acknowledge and congratulate them. A SBMI student group submitted an AMIA 2018 Student Design Challenge proposal that was selected as a top eight finalist. The team includes MS Students Ankita Misra, Danilo Pena and Stephen Simington and PhD Students Carlos Perez-Aldana and Nina Smith. Ankita will represent the group at AMIA for presentation of the poster. Associate Professor W. Jim Zheng, PhD authored a new article that JAMA recently published. The article is titled "Informatics, Data Science and Artificial Intelligence." Assistant Professor Deevakar Rogith, PhD is a Co-PI on a new CPRIT tobacco control and lung cancer screening grant. The grant is worth over $1.3 million and titled "Increasing Access to Smoking Cessation and Smoke Free Home Services for Low-Income Pregnant Women in Northeast Texas." 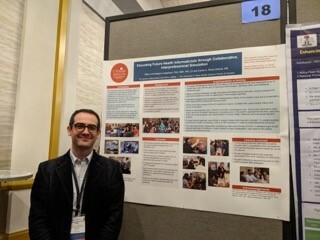 In August, PhD Students Carlos Perez-Aldana and Nina Smith had posters presented at the 2018 Public Health Informatics Conference. Carlos is pictured in the photo to the right as he presented his research. Student Health Services recently announced the launch of a new wellness tool available to all students, faculty, and staff at UTHealth. TAO (Therapy Assistance Online) is an interactive, self-guided, web-based program that consists of tools and educational materials to help users both learn about and change how they think and feel. TAO addresses common concerns such as stress, sadness, living with pain, drug/alcohol use, and relationship/communication issues. After enrolling with an UTHealth email address, users will have free, unlimited, 24/7 access to research-based modules, practice activities, and the Mindfulness Library. Work completed in this self-guided program is completely private, and users can complete as many or as few activities as desired. Enter your UTHealth email address to sign up during the first visit and fill out any personal information. An enrollment key is not necessary. As always, individual appointments are also available for psychiatric and psychological services at the Student Health and Counseling Clinic. Call 713-500-5171 for an appointment or call the IMUT Hotline for access to a mental health professional 24/7 at 713-500-4688. The CDC's Public Health Informatics Fellowship Program (PHIFP) is currently accepting applications. PHIFP provides on-the-job training for professionals with either a doctoral or master's degree. While working in CDC programs to enhance the agency's informatics workforce, fellows help state and local health departments and international public health agencies solve complex public health informatics challenges. They apply expertise in information science, computer science, and information technology to address current and future informatics needs. Nov. 5 is the deadline for submitting an application. For more information, visit the PHIFP website or participate in a PHIFP webinar to learn more about the program. For questions about PHIFP, send an email to PHIPF@cdc.gov. Amy Taylor and Travis Holder are the liaison librarians for SBMI at the TMC Library. This fall, they will continue to hold office hours every Tuesday from 1 - 5 p.m. at UCT 1410. Students and faculty are welcome to set up an appointment or just meet with them on a walk-in basis. Amy and Travis can also meet with SBMI users online via GoToMeeting. Students and faculty will find Amy and Travis's expertise handy when conducting library research. Whether you are just looking for a full text journal article or trying to scour research databases for a systematic review, the librarians are here to help. Students and faculty can contact Amy at 713.799.7184 or amy.taylor@library.tmc.edu and they can reach Travis at 713.799.7166 or travis.holder@library.tmc.edu. The Student InterCouncil (SIC) will host the 20th Annual Salutation event on Oct. 3. This event is the formal all student welcome reception for new and returning students entering all six UTHealth schools this fall. The event time is 5:30 p.m. - 7:30 p.m. and it will be in the Cooley Conference Life Center. The event is co-sponsored by SIC and UTHealth President Giuseppe Colasurdo, MD. Parking validation will be available for the UT Research Park Complex Parking lot located at 1941 East Road across from the School of Dentistry. Free food and beverages will be provided and students must bring their UTHealth ID Badge to the event. HIMSS19 will take place in Orlando from Feb. 11-15 in 2019. HIMSS is currently accepting Student Case Competition submissions. Applicants have until October 10, 2018 to submit their application. To learn more about this opportunity, visit the HIMSS19 website. Please direct any questions about the competition to earlycareerists@himss.org. Several SBMI faculty and staff members will be traveling in the coming months to attend conferences to promote our degree programs. We invite any prospective students or alumni in the area to visit us during these events. Professor James Langabeer, PhD, MBA was included in a Houston Chronicle story about an announcement by some health insurance companies that will no longer reimburse people for OxyContin prescriptions. Healthcare Informatics ran a story about the SBMI's new Doctorate in Health Informatics (DHI) program. Healthcaredive wrote a story on a survey by Professor Dean Sittig, PhD, showing that many health care organizations are not using voluntary e-health record safety recommendations. Cooley Conference Life Center, 5:30 p.m.